With Stay Human Vol. II, Michael Franti and Spearhead offer a balm, if not an antidote, for life's large- and small-scale struggles. The last few years have been hard ones for the socially conscious, to say the least. Where acceptance of the rich diversity of humanity once seemed in reach, now even the concept of tolerance often feels in question more often than not as mainstream political rhetoric moves away from trying to connect and leans into outright divisiveness. Michael Franti is nothing if not socially conscious. As the founder and leader of reggae fusion group Spearhead, his music has long embraced revolutionary ideals of peace, love, and understanding. His 2001 concept album Stay Human, with a central anti-death penalty message, celebrated how "all the freaky people make the beauty of the world", an evergreen sentiment. Eighteen years and seven albums later, Franti and Spearhead have weathered the same traumatic cultural storms as the rest of us, and Stay Human Vol. II proves that the group still has every awareness of the world today - and has no intention of giving up just yet. While Franti's music has never been frivolous, the events and issues he draws on in Stay Human Vol. II feel particularly weighty. Bittersweet ballad "The Flower", a vocal duet with Victoria Canal, advocates the end of gun violence, making particular allusions to the Pulse mass shooting in Orlando. The group and guest vocalist Hirie revisit 2010 Spearhead love song "Only Thing Missing Was You" with a broader lyrical perspective, finding refuge from global crises in individual love. Perhaps this point of view -- that any small shifts toward happiness are worthwhile in the grand scheme of things -- is what gives Michael Franti and Spearhead the perspective and grace that keeps their music sincere rather than letting it slide into dull platitudes. 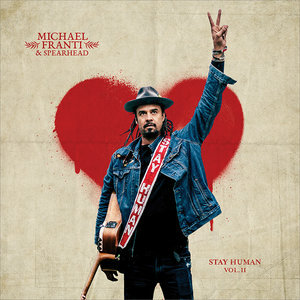 Humility and hope give single "Stay Human 2" meaning: "One love / One life / Throw your hands up high / Cause all I'm trying to do / Is stay human with you," Franti sings as the band breaks into warm grooves. Franti looks to the past as he looks to the future in trying to create a meaningful present, reminiscing about summers swimming and listening to Marley on "Summertime Won't Last Long" as a reminder to live each moment in full. Musically, Stay Human Vol. II knows no limits, dabbling in funk guitars on "You're Number One", incorporating strong electronic beats on "This World Is So F*cked Up (But I Ain't Ever Giving Up on It)" and "Extraordinary", and adding a bluesy twang to "When the Sun Begins to Shine". As always, though, Spearhead is at its strongest in the intersections of acoustic folk and electric reggae. By far the album's standout track, "Show Me Your Peace Sign" touches on all of Franti and Spearhead's respective strengths. Franti sings of inclusive, universal love ("It's the little things in this great big world / And it don't matter if you're a boy or a girl / And it don't matter if you're someone in between") and mobilizing for peace ("I want to be standing next to you / When the revolution comes") to catchy beats and a simple melody that make it an exquisite protest anthem for the modern world. The album ends with "Take Me Alive", Franti's vow to "love out loud / And live without permission" in solidarity with his fellow peace-loving humans. Stripped down to Franti's unaccompanied voice and acoustic guitar, it makes for a poignant ending to a powerful album. Never have the values that Michael Franti and Spearhead have always espoused been as overtly under attack by political leaders and movements of hatred as they are right now, and Franti shows no signs of slowing down in expressing resistance. Documentary film Stay Human, featuring Franti's extensive travels to different parts of the world as he explores life on this planet, has toured festivals and is now coming to the general public. Album Stay Human Vol. II is a perfect accompaniment to it, a refreshing dose of accessible music with life-affirming messages: a balm, if not an antidote, for life's large- and small-scale struggles.